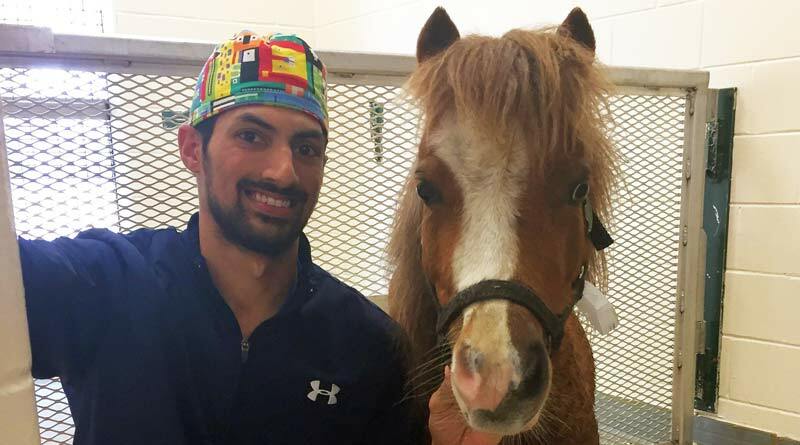 A miniature horse who underwent a surgery normally reserved for dogs on his dislocated hip is thriving and back to his normal routine a year on from his injury. Three-year-old Rico was found down and non-weight bearing lame last spring in a field by owner Shelby Lewis, of Lake City, Florida. Rico’s veterinarian Jennifer Miller diagnosed a dislocated off-side hip, and contacted the University of Florida’s College of Veterinary Medicine to ask about treatment options and cost. “The only horse that might have a surgical option would be a mini, so he had an opportunity that another horse might not have had, as surgery would just be too difficult,” Miller said. A larger horse’s weight would make even obtaining a diagnosis problematic, but she was able to get “pretty good” images of Rico’s leg, she said, aiding in his diagnosis. Although it was unclear what had caused Rico’s injury, trauma of some kind was suspected, UF assistant professor Taralyn McCarrel said. At the time Miller responded to Rico’s owner’s call, she had a UF veterinary medical student working with her on a clinical rotation. The student was aware of an internal fund that was sometimes used to offset the cost of veterinary care in certain equine cases for teaching purposes and in cases of financial hardship on the part of the owner. Miller knew that Rico’s owner, Shelby Lewis, a college student from Lake City, had limited funds, and that the type of surgery that might typically be conducted to fix the hip joint and hold it in place in foals with similar injuries would have been cost-prohibitive. She relayed the situation to McCarrel, who was able to obtain permission from UF Veterinary Hospital administrators to offset some of Lewis’ costs through the Boone Memorial Fund. McCarrel then researched her approach, delving into the small animal literature and limited equine literature to prepare for a femoral head ostectomy in Rico. The procedure is a well-known surgical option in certain circumstances in dogs with hip dysplasia or a dislocated hip that will not stay in the socket on its own, similar to Rico’s case. However, femoral head ostectomies are seldom performed in horses. The reason Rico still had good muscle mass was because he came in for surgery soon after his injury, she said, adding that in long-standing cases, the muscles become small and weak due to lack of use from pain, thus there is little muscle to support the limb after surgery. McCarrel was mostly concerned about accessing Rico’s hip joint with minimal trauma, as the joint in a mini-horse is much deeper than in a dog due to the very muscle mass that would help him retain strength in his recovery. “As equine surgeons, we don’t typically approach the hip joint,” McCarrel said. The femoral head ostectomy involves cutting and removing the top part of the femur, or thigh bone. This eliminates the hip joint, and transfers weight bearing to the muscles of the limb until a false joint, known as a pseudoarthrosis, forms through extensive physiotherapy, she said. The drain was removed several days later and Rico’s incision healed without complication. Rico went home about a week after his surgery on April 6, 2017, with instructions for his owners to conduct daily physical therapy. “We showed them how to make him flex and extend his leg, which is called passive range of motion exercise, and told them to do that for two weeks, followed by forced walking and continued passive range of motion exercises until he could be turned out into a small area daily,” McCarrel said. The rehabilitation program takes a lot of commitment on the owner’s part, but is essential to the success of the surgery, she said. Lewis admits the process of recovery was not easy, for her or for Rico. Just over a year after his procedure, he shows little sign of the trauma he endured. “He’s just my little angel,” Lewis added.